- Measures: Width: 215 cm Depth: 059 cm Height: 222 cm Weight: 840 kg - 2 year guarantee! - Free Shipping! The sink can be on the left side or on the right side of the Barbecue and it can also be changed by a polished marble stone. The price keeps the same! 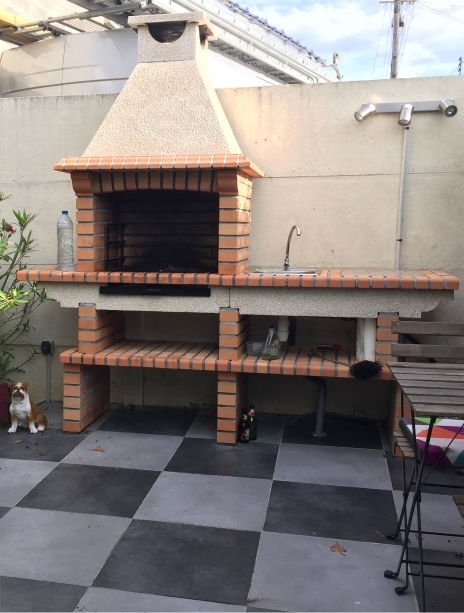 Brick Barbecues For Sale AV2200F Free shipping to England, metropolitan France*, Monaco, Belgium, Luxembourg, Italy and Spain. For other destinations please contact us. "Grilled Halibut With Oriental Sauce"
Combine orange juice, soy sauce, ketchup, oil, parsley, lemon juice, oregano, pepper and garlic in a small bowl. Brush the mixture evenly on the steaks, refrigerate. Brush the grill lightly with oil. Light the coals or gas grill for a medium fire. Place the steaks on the grill rack and cook turning once, about 5 to 6 minutes per side, or until the steaks flake when tested with a fork.